"I will be answering all questions from fans and general public. So please b there. There are some things that I want to b known" Randy had tweeted. See, we are burned by Randy making an appointment, stating he will answer our questions, ranting then ending the session. It never feels like a two way conversation. So I tweeted on the very day that he made his last appointment that he was going to let us down again. But I was hoping to be proven wrong. So I tuned in. He gave us a fair warning that he was slow to type. Boy, was he right, my hair turned to gray while waiting for him to tweet. Then he started lollygagging...about his a$$, then about the veracity of Michael’s Jackson’s Will. He tweeted “There r so many things wrong with this will. Where do I start??? ?” I was like “please don't start! FANS were the ones who pointed out the oddities in the so-called Will to Brian Oxman who was happy to present OUR hard work to Jacksons as his. As if we need a course from Randy! And here is his rebut for arguing the veracity of the alleged Will “misspellings & discrepancies, etc” What "misspellings" is he talking about? No wonder the Doggone Will hasn’t been properly contested. Randy sounds clueless, he sunded the same on CNN interview. It is sad when the fans know more about Michael's affairs than his own family. Before Randy started tweeting, I tweeted "RANDY WILL PRETEND NOT SEEING IT IF 1 OF US ASKS THIS. PLEASE LETS MANY OF US TWEET HIM, ASKING HIM IF THIS IS TRUE"
Below article claims that Katherine didn't want to sue AEG but Randy was the force behind Mrs. Jackson to "encourage" her to sue. From the context, I gathered that the "source" was none other than Howard Mann et al. Jacksons bemoan about how the media lies about them, then when we go to them to ask the accuracy of a story, our inquiries fall onto deaf ears! Fans have been asking Randy to confirm or deny this story since it came out! Just today, I myself sent 16 tweets, requesting him to deny or confirm. My followers also tweeted him the same question. There is no way he didn't see the question, it was too convenient not to answer. Randy's silence was a tacit confirmation that the story is true. It wasn’t just this one question, fans asked many legitimate questions. Instead of using his celebrity to spread awareness and seek justice, the brother of the “Greatest Entertainer of all Time” wasted a precious opportunity to take a question about his a$$! If you are not good at public speaking, perhaps, you shouldn't! Every time Jacksons open their mouths, it is not a matter of if they will say something dumb but what dumb thing they will say. How was a man of Michael's caliber related to these people, I will never know. You wanna embarrass yourselves? Go to town with it! But you keep plugging Michael Jackson related subjects in your nonsense, media is having a field day with it and you embarrass the fan community. Since Jackson Family insist on not having a family publicist, they should stop talking about Michael Jackson and his affairs. Since his death, I haven't heard one sensible thing coming from the Jacksons! How many more times do they expect the fan community to sweep things under the rug? And what was it that Randy wanted "to b known"? A plug for a Jackson 5 reunion!!!!!! Tito: We should open what? Randy: Tito, go sit in that corner! (Tito yells from the corner): What trial? Jackie: But what about Michael? Jackie: But what if Michael's fans don't the idea? Wouldn't this be pouring salt on their fresh wounds? Isn't this too soon. What if they object to this idea and not buy tickets? Randy: But how we gonna get Michael to endorse this? 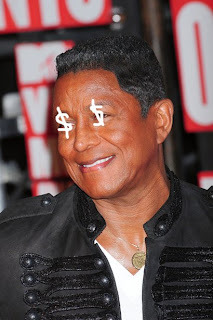 Jermaine: We will tell 'em that Michael would want us to do this & chi-ching! NOT JACKSON 5, GET A DIFFERENT NAME! If you want to promote your talent....um...or lack thereoff and if there are suckers wantin' to pay to see you screech, more power to you, by all means, reunite. But Jackson 5 is a brand, it represents a group lead singer of which was Michael Jackson. Michael is dead and he is no longer part of this group. Neither his children nor his Estate is receiving any profits from the proceedings. So get a different name to represent a group without Michael Jackson and with Randy Jackson. Jackson 5 reunion is like "Raelettes" reuniting after Ray Charles' death and calling it a Ray Charles concert! Reunite! As if Jackson 5 was in full swing before Michael died! STOP PLUGGING MICHAEL TO PROMOTE REUNION! "He would have wanted us to do a reunion"
How would you know, you weren't part of Michael's life for ages? Too bad this clairvoyance ability didn't surface while Michael was slowly dying! "Frank Dileo put the deal together without our knowledge. We had NO idea this was going on & that's why he was sued for it"
In 2008, AllGood Entertainment wanted to organize a one day Jackson Family reunion event in Texas. President of AllGood Entertainment approached Joseph. It was Joe who sent Patrick to Frank Dileo to close the deal. The only Jackson Michael included in his life was Katherine. So Joe knew next to nothing about Michael's business affairs and Frank Dileo was NOT Michael's manager. Jacksons KNEW about this family reunion event before Dileo ever got into the picture. If you remember, in Oct 2008, Jermaine had announced this Family reunion. Frank Dileo didn't get into the picture until Nov 2008. One day after Jermaine's announcement, a shocked Michael Jackson released this statement "My brothers and sisters have my full love and support but at this time I have no plans to record or tour with them"
And they claim Michael would have wanted this reunion! Michael DIDN'T! Even more than Michael's Estate, his fans are very protective of his brand. Even if the executors throw bones at the Jacksons and turn a blind eye, the fan community had it with Jacksons exploiting Michael's brand which didn't come to today by endorsing just whatever! If it floats your greedy boat to do a reunion, do a reunion. But do not call it Jackson 5 and do not plug in Michael's name to promote it!!! You all are plain wrong to make a living off of a dead man! The world is sick of condemning you, but you all aren't sick of being condemned! It makes you wonder why Michael opened his doors to fans but he didn't to his siblings. It makes you wonder how could he have possibly felt lonely among such huge family. Did Michael Jackson hire Leonard Rowe as his manager? She knows, her actions were wrong that's why she hide from the public until it came out through legal papers what the end of the 2009 year if not longer. their children & nieces & nephews. would have had very simular looks of the main Jackson Family. way in hell, he was related to them directly.